Freelance writer, existentialist, philosopher, renegade artist, astrophysics enthusiast and wearer of the perpetual smirk. I’m a 20-year-old author studying English and Philosophy at an unspecified location of semantic density (i.e. a library). Under variable pseudonyms, I’ve worked as a freelance writer since I was 15, and my age-old aspiration remains to become a successful writer of novels. When not writing, my hobbies include thinking, rock climbing, travelling, swing dancing and thinking. I speak English, German and Sign Language, but my native language is sarcasm. I’ve devoted far too much time to attempting to read the growing pile of books in my bedroom and figuring out the secrets to man’s existence. I’d say I’m about 10% there on both of those. If anyone needs me, I’ll be standing by this tree, waiting for Godot. Or you can follow me on tumblr @arvidwalton. The Book Addict’s Guide is devoted to providing readers with an unbiased, straightforward read of the Myers-Briggs Theory (MBTI). Minions, or readers, can find answers to any question on Ask an INTJ Anything, or find out the MBTI type of almost any character by Requesting a Character. In fact, The Book Addict’s Guide to MBTI includes a large library of character typings that are currently not found anywhere else. For newcomers to MBTI, we have just the thing to help you familiarise yourself with the Myers-Briggs Theory: the Idiot’s Guide to MBTI! And for anyone with a completely misunderstood INTJ friend, we have just the thing for you too, Understanding Your INTJ Friend. The Book Addict’s Guide is primarily written by Arvid Walton, but also accepts a variety of guest posts. 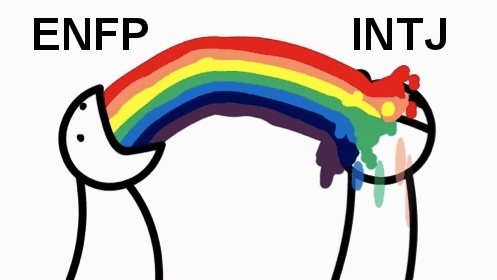 Most of the net discussion of the Myers-Briggs Theory occurs on Tumblr and throughout a network of interspersed blogs. As an INTJ, it is in my nature to question most canonical bodies of information, and as such, readers will notice that many of my opinions regarding the Myers-Briggs types of various fictional characters differ from the cannon. My explanation for this is simple. I strive for accuracy and authenticity in my MBTI typings, and to achieve this, I frequently write in opposition of mass consensus, deriving my information from more credible sources than fan “theories” and shipper rationalization. In my research, I do consult social media and fan opinions, but always as a secondary resource. When a book character is requested on this site, I read or re-skim the book, consult the leading literary criticism regarding the character and then compare the subsequent analysis to everything I know about MBTI. If a film/TV character is requested, I watch the movie(s)/episode(s) that the character is part of, conduct an analysis of their behaviours and motivations and line this information up with MBTI. The only current exceptions to this rule (on this site) are the characters from BBC’s Sherlock. If any other exceptions occur, I will make sure to specify. In the case that a real person is requested, the process becomes more difficult because the types of information available vary quite widely in this realm. Celebrity typings typically require a detailed marathon of interviews and news articles. Historical figures often require me to read biographies or watch documentaries, and the trick here is to find a happy-medium in the myriad of different accounts of these people’s lives. Over time, I may change my analysis of a character as new and better information surfaces. Feel free to disagree with me or point out potential errors in my theories, but please don’t do so in ignorance. Know what you’re talking about if you’re going to argue with me. First I want you to congratulate and thank you because of having spent your time at making this blog; it´s really well done…the design, the way of organizing the information (although I must say, there is a lot of information that I don´t find at the upper bar and I have to be stalking the whole site to find some stuff haha), the gifs and everything in general; because you are an INTJ I suppose you have things to do and plans for your goals, so taking this time is sweet (although maybe it´s part of your plan ha?) (“You hitting this follow button is all part of my diabolical plan #subtlety is an art”) (kidding). SO, lol, going back to the question> What about if you are an ambivert? Oh, me gustaría que mi español era mejor, pero no he tenido muchas oportunidades de usar que (no desde que tenía 9). Me alegro de que ama a la gente. Eso es importante. Gracias amablemente por su verdadera preocupación, y me gustaría ser su amigo. En este punto, mi consejo verdadero y honesto a todo el mundo confundido acerca de su tipo de personalidad es la siguiente: La teoría MBTI no puede responder a todas las preguntas más significativos de la vida o le dirá que eres. Lo que eres es definido por lo que decida hacer con su vida, qué pensamientos que se permita pensar, y qué motivaciones que se permite tener. Mi consejo para cada persona es dejar de buscar por sí mismo. En su lugar, la búsqueda de principios morales que se pueden aplicar a su vida para hacerse una persona más fuerte y mejor. ¿Cómo llegaste a tener un conocimiento general de ciertos idiomas?, me parece genial, pensé que tal vez te gustaría que te escriba en español para practicar un poco. ¿Qué sucedió cuando tenías 9? ¿Cómo podríamos comunicarnos? no estoy tan involucrada en las redes sociales y por el momento estoy más aislada de lo que suelo estar para evitar distracciones de las cosas que tengo que hacer. ¿email o qué medio sugieres? P.D: ¡Me encanta tu descripción! He aprendido idiomas porque me gusta la lingüística. Aprendí español en la escuela como un niño. Mi madre es alemana, así que aprendí lo que sé de alemán de ella. Y aprendí ASL para la diversión como un adolescente. Recientemente, he estado tratando de aprender Farsi. No quiero hablar de lo que ocurrió cuando tenía 9. Lo sentimos. No soy muy activa en las redes sociales debido a mi salud, pero si me siguen en Tumblr, te seguiré hacia atrás. De vez en cuando puede ser capaz de conversar en tumblr, pero no podemos garantizar la frecuencia. Todavía estoy tratando de obtener un diagnóstico de lo que está mal conmigo, pero voy a actualizar todos cuando me entero. Si tiene la oportunidad, mire a su alrededor y encontrar algo hermoso hoy. Es siempre vale la pena. ¡Tonga un buen día! I will comment this time in English because maybe it’s a little bit annoying for you to translate (or maybe it’s not, I thought you would like a short language challenge ^_^) I find it really awesome you like languages so much! I have considered learning ASL too for fun :) and Farsi sounds challenging, is it? It’s fine about not wanting to talk about that, no problem :) and I am also usually not very much in the social media either. I don’t have Tumblr but I will get it when I finish a project I am working on and send you a chat, thanks! and no problem if the communication isn’t frequent either, I understand that too. I really hope you get better Arvid…, and same to you. I hope you find something you can stare and lose yourself at! if not, one can always search for pictures of Aurora Borealis in Google! Thanks, I will send you a chat when I finish my project! :) bendiciones! Very busy at present. I apologise for that. Bendiciones to you as well! Over the last year I found out a lot about myself, my personality and mind. Last week I discovered the MBTI and that I am an INTJ. It explains a lot. Now I am in a constant state of analyzing my past and current life, the way I think, act and interact with people. Your site is helping me a lot. Knowing that one is not alone with certain personality traits, thoughts and… feelings… is kind of nice for once. I just wanted to leave a comment to thank you and tell you that I like your site, style of writing, your sarcasm and humor. You seem to have a beautiful mind. Best wishes. Kyra, Germany. Hello, I hope you have a great day. Umm… not sure how to say this but I think I might as well make a confession. I had stumbled upon your blog since last year and having crush on you if not your writing style right after, even though I still confuse about your gender (now that I know your gender my admiration remain the same). Your writing emulates that sense of confident, fresh and alluring aura which I find stands out from other blogs. Now, I know it’s inappropriate to blame you upon our first meeting but I can’t help feeling agitated when you decided not to reveal your works (pardon my fangirliness). If it not too much of trouble, could you perhaps share your other blogs? Or even dedicate a page that provide fan service to us fans? You had it coming with good writing and all. (please don’t kick me, I come with chocolate and teddy bear along with a blue card for your signature). Recently I heard that you got sick. I don’t know much about it but please take care of yourself. P/s: Don’t worry, I mean no harm. Now that I shared my opinion, I’ll retreat to my small tent of silent fan/reader. Sincerely, an Intp wanderer. Well, I have to say I was not expecting this, am quite flattered and would love to get to know you more. It’s very admirable of you not to judge me on the basis of gender, so thank you for that. As I tell everyone who’s shy to comment on my blog, don’t go hiding in your tent when there are stars outside it. And, fear not, I am not the kicking type…I’m more of a “speak daggers […] but use none” type of person (Shakespeare). As always, the reason I don’t connect this blog to my professional body of work isn’t because I don’t appreciate people like you. I do this mainly for the sake of preserving a certain authorial legitimacy within the particular genres that I write. I may someday decide at my own digression to change this policy, but no guarantees. I do have a casual tumblr blog (which you can find in the sidebar of this blog), but it’s more imagistic and far less of my actual writing. Occasionally I might post updates about my general life status there, but again, mostly just pictures and reblogs. I have some questions for you, but I am slightly ashamed of the idea of them being public, but I can’t think of another way to ask you or contact you. Would it be okay initiate correspondence via email or some manner that would enable a more private conversation? You can private message me on Tumblr if you would like. To be honest, I was at first skeptical of the accuracy of the blog. Character typing, in my opinion, is a difficult and daunting task, requiring extensive knowledge on MBTI functions and strenuous mental activities. (Gave myself a headache the first time I dived into the theory of functions — tried to absorb everything at one go. In hindsight it was a stupid move) Moreover, when I was just beginning to embark on the journey of self-discovery, A.K.A intensive reading of all articles about MBTI, a handful of terrible writings managed to result in incorrect perception and embarrassing assumptions about the types. It is only after months of reasoning and inquiry that I grew confident of my understanding in MBTI, and learnt (the hard way) to be wary of online articles. (Sadly, that’s my only source too) Therefore, I was cautious, albeit also very excited, when I chanced upon your blog. At this point, the original purpose of this comment is lost to me, but I remember the gist of it: I just want to drop by and say that your blog is one of the best I’ve seen out there in the open Web, an oasis in the desert of mistypes and elitism (especially in the case of NT articles), a gem unearthed. Some of my favourite articles are from the ‘How To Tell The Difference’ series; they are of tremendous help to me. I’ve also managed to derive great satisfaction from from your Answers (Ask an INTJ anything). By reading your articles on character typing, I’ve grown in my knowledge of the functions. Also, the way you organise your blog makes it easy to locate different articles (a pleasure when it comes to stalking this place) and I was recently (finally) persuaded to join the ranks of your minions. All in all, it’s been a pleasure reading the things you post on this place. You have earned my admiration and respect, I now hail you as teacher, and will in the future strive to acquire as much an understanding in this field as you. Many thanks for your warm remarks. I’m glad to know I’ve been helpful! Well, what a nice and interesting blog to read ! I only got to read a few articles and your about-section, and I’d like to read much more articles before posting any comment but I just can’t. I was actually supposed to study but I just got lost in your blog and that was a wonderful sensation, see how much effect it had on me ! Thank you for that, there’s a long time I didn’t find such an interesting place, gathering so much things I like – seriously ! philosophy, MBTI, writing, and so much things I haven’t had time to explore yet ! I feel like it’s Christmas again ! And I have to say, you seem to be quite a fascinating person too. The kind I’d love to debate with and listen talking about all these fantastic subjects. Anyway, thank you again, I’ll probably be hanging around for a while ! PS: there’s quite a lot of adjectives and exclamation mark, sorry for that, I almost surprise myself, I probably got carried away by my enthusiasm. PSbis: can I officially blame you if I fail my exam tomorrow ? I’ll probably be needing such an excuse to convince myself. Oh dear. Do be careful. Studying is…I was going to say studying is important…but I don’t know that I would go that far. And yes, I am always interested in getting to know my readers, so nice to meet you French INTP. You have permission to blame me for failing your exam, but I am not responsible for the consequences of using that excuse. Very interesting blog. I’ve never met INTJ in real life so it’s nice to find someone who is like-minded even on the Internet. I thought you’d be interested to know that for some reason I thought you were a girl/woman all through reading many of your posts right up to reading a question by someone who called you “mr. INTJ” or something similar. Go figure. I’m a very androgynous person. People usually pick up on one or the other gender from the way I write, but they’re not always correct. I’ll let everyone debate that as much as they want. I should love, love, LOVE to know the titles of your books. I’d love to share, but as I’ve said before, I like to keep my professional writing separate from this site as a privacy measure. Will this be true of all your future works as well? And considering the fact that people are asking your questions and often times reveal more about themselves in those questions then they think. My question and comment is no more then theirs, and quite possibly even less, depending on how you read it. Which parts your chose to focus on and read between the lines. Some people can say more by what they don’t say then by what they actually say. Yes….however I am an adult…and I never uses names, or places. I found your blog yesterday, I absolutely love it. One of the best blogs I have stumbled across recently about MBTI types and explaining them, how they are beyond the stereotypes. Which unfortunately have made there rounds about the internet and even the sights that are suppose to be more accurate fall pray to the stereotypes and labels. I like that you have an internal conflict with typing, I have experienced the same thing only recently stumbling upon this in depth. I had heard about personality types like this when I was in school, but didn’t get into till now. It is a rather interesting conundrum of typing people, but not wanting to stick them in a box. I have come to rationalize that I don’t put people in a box persay, remember its bigger on the inside. (Dr. Who reference intended – love that show) My point is while the box does contain its stereotypes, it is a whole lot bigger on the inside if we dig deeper into it and figure out how we process our information as well as how to develop our lesser functions. And work in harmony and accept how we think, feel, and process information. On that subject, I think most of the stereotypes for my type are exaggerated quite a bit, they are spot on to a degree. Especially for ones who are immature and have less developed lesser function. I would like to ask – how good are you at typing people, just by the questions they ask or if they simply write about themselves. If you would be interested in seeing if you can type me, I had to write an essay for a psychology class, have since updated it to reflect my life now about Who I am. My teacher found it quite interesting because I went about it by answering the questions with out necessarily answering the question. I would find it quite interesting for you to read it and tell me what you think. I’m fairly decent at typing people based off of things they say and ask. However, as I am currently starting a new term at university, it’s unlikely that I will have time to answer lengthy questions quickly. Feel free to submit your question in more depth in the Ask an INTJ section of this blog, I’ll be happy to help you out (as time allows). Its all good, we all have a life. But I will continue to check your blog form time to time. It is one of the more interesting ones I have come across. And I very much like how you type characters, basing it more on there actually thinking and thought process as opposed to basing it on stereotypes. It is a breathe of fresh air. I may look at the list and see if i can help out, if i have the time. I myself am an INFP and I’ve felt a little bit of the stereotype backlash. People assume that we’re fragile, over emotional butterflies who live in a perpetual state of unreality. Sometimes this is true *strokes butterfly wings fondly* but mostly it’s nothing but a meme-induced nightmare. Personally it might be my over-developed Te. I have an ESTJ mother and an ENTJ older brother so… one learns to adapt. Not sure whether you meant to ask a question here, but if you do have one, the Ask an INTJ section is always open. I just figured some random person was doing the writing and you were just sharing the posts. I work undercover –but please do enjoy your blonde moment while I cackle maniacally at the fact that you still don’t realise I’m actually just a sentient computer called Jane working under the pseudonym of Arvid Walton. I’m good aren’t I? Why, hello Jane! How is Lustiana? I hear it is quite beautiful this time of year! Apologies, I will not use my real name, as I do not like to reveal it online. Likewise! Your deviantart cats are lovely by the way. My ENFP sister tells me that INTJs are like cats because you can never tell whether they like you and they’re selective about who sits in their space. INTJs being like cats sounds like music to my cat lover ears. There’s a lot of likeness in behaviour, I agree. Because I have a lot of experience with cats I “read” them pretty much the same way I read people so I think that’s why cats in general tend to like me. They quickly notice that I understand them and because of that they open up and communicate with me – and I can totally recognize that behaviour in myself. There’s no use in wasting energy on someone who won’t understand you, is there? Just give them that INTJ/grumy cat glare! Your sister sounds very interesting. I saw you mention her in another post as well. My older sister is also an ENFP, but she doesn’t understand me at all unless I adapt to her way of thinking first. I’m a total enigma to her when I’m 100% myself and I probably freak her out a little (or quite a bit), while she mostly makes me… exhausted, even if I love her. She fails to see the humour in it though. Which makes it even funnier, if you ask me. “There’s no use in wasting energy on someone who won’t understand you.” Basically the motto of Dagny Taggart (INTJ) from Atlas Shrugged. I remember starting the first few pages of that book and laughing my head off in airport somewhere because she kept getting angry at people for not being able to understand her points. My sister. The ENFP. I would agree that I have to adapt her mode of thinking before she will understand me, but the very fact that she tries to understand is half the battle. I’m still an enigma to her, but I don’t think I freak her out. She likes my weirdness, and I like her hippy-ness. But, yes, she does exhaust me when she gets slap-happy. The picture was clearly drawn by a very tired INTJ. If you want a real laugh, go back to your childhood and watch El Dorado. The ENFP/INTJ vibes are hilarious. Nice to meet you too! I’m always happy to know my work is helping to distil INTJ isolation. P.S. The gifs are bigger on the inside. Thank you for making your site – it’s beautifully done. I wish you well.